Gulf Front, Oceanfront Home Best Value! In Gulf Shores/Fort Morgan...sought after, beachfront, low density, family oriented and nature lover paradise. Straight out from 'Architectural Digest' with spectacular, ocean views of the Gulf Coast. This is your chance to treat yourself to one of the most luxurious, spacious, professionally decorated 4 bedroom gulf shores vacation oceanfront home in gulf shores/Fort Morgan value for value! 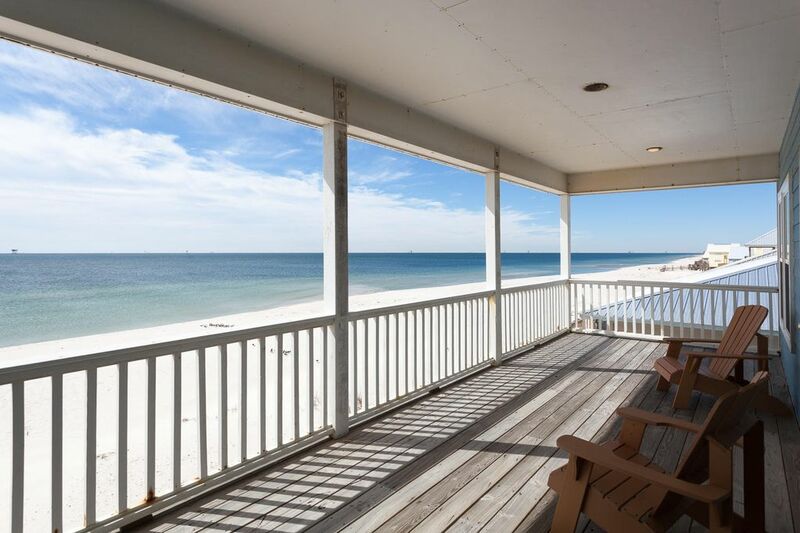 This new, spacious, beautifully decorated, oceanfront vacation beach house/duplex is right on the sugar-white sand, with sweeping panoramic views and warm Gulf water. The ocean is barely a few steps away from the home! This Gulf front vacation home is a beach lover haven. It lulls you into relaxation, away from the madness of everyday life. It is ideally located to provide tranquility to rejuvenate your soul. No high-rise sprawl. No congestion (you will lose yourself here), but yet within a short drive to restaurants, multiple golf courses, outlet mall shopping and amusement centers. The marina is just minutes away. Soak in the splendor of this quiet paradise in this spectacular Gulf Shores Oceanfront vacation home. This luxurious Gulf Front vacation home is the perfect setting for fun-filled quality vacation and is designed with all the comforts of home for entertaining large or multi-families or couples looking for a romantic getaway. This spacious and quality Oceanfront Gulf Shores vacation home is professionally decorated and accessorized with upscale furnishings and stocked with all the extras to spoil you! Plasma TV and free high speed Internet for you! When you walk into this spacious Beachfront vacation home, you will say 'WOW' to this colorful and whimsically decorated house. You will enjoy a very large well stock kitchen, dining, and a spacious entertaining room as well as 9 foot ceilings, crown molding, wireless internet, TV in every room, built-in sound system with CD player, DVD, ceiling fans, a private hot and cold shower underneath the deck, Playstation, beach chairs , gasl barbeque grill - all the extra conveniences and comfort that you can enjoy for a quality vacation. The large entertainment room is surrounded by windows with designer custom drapes to fully enjoy the sweeping views of the Emerald Coast. The family room leads to a large covered deck and porch. Watch spectacular and romantic sunset from the spacious Ocean front covered porch while you sip your favorite afternoon beverage. Let your eyes drink in the magnificent ocean views. Feel the gentle cool breezes, smell the fresh salt air. You can watch dolphins, soak in your children or grandchildren joy and contentment as they build sand castles, swim, fish, fly kites, indulge in your novel or do nothing at all.....this is living at its best!! There are four very appealing and superbly comfortable bedrooms. Two gulf Front rooms and two bedrooms with bay views. Listen to the crushing of aquamarine waves on the sugar white sand beaches as you fall asleep each evening in premium custom made designer fabric bedding and cushy down pillows. Even Bunk beds are specially custom made to ensure that it is sturdy and comfortable for both adult and children to sleep on. Pottery Barn Furnishings and bedding in bunk room. For those who want the best and value....welcome! Thoughtful amenities are also given to the little ones - baby cribs with firm baby mattress, childproof stair gates, booster high chairs, kids videos, walk in showers, kids beach toys and more. Direct Oceanfront. Awesome views. Watch dolphins on our deck! Nice beach front home. Comfortable, clean, roomy & well stocked. We only had 3 adults but this would be great for a large family. No crowds! I'm giving 4 stars instead of five only because the outside shower didn't work so it was very interesting for us after our beach adventures trying to spray off all the sand from ourselves and our kids. But the house was AMAZING! INVITING! RELAXING!! It was such a treat to see dolphins jumping out of the water while sitting on the porch, my boys loved that! The house felt like home by the end of our stay and I hope I can bring my family back to Big Blue in the future! Thanks again Muehring Family for sharing your home with others, it was a real blessing!! Beautifully decorated and furnished with plenty of room for family, comfortable sleeping, large dining table and great view from the decks. It’s a duplex but never heard any noise from family staying in the other unit or them from us as confined from visiting on the beach. Loved that there were no crowds and very family friendly. Property manager was always quick to respond to any questions or concerns. Great experience!! It is a pleasure to host your gracious family in our home. I am glad that you get to enjoy qualtiy family time in quiet beach. Thank you very much for sharing your reviews and I look forward to hosting your family again in the near future! We called and discussed the home with HomeAway before we rented. The house appeared to have two front doors. We asked if this was duplex. We have previously had bad experiences with duplex’s and don’t rent them. The advisor at HomeAway assured it was a single family home, not a duplex. Either the advisor lied to us or does not know the property they have listed. The property was a DUPLEX with renters in the opposite half. They were very loud, parting all night, took over our part of the down stairs, used our shower, etc. It was a terrible experience. That is why we don’t rent duplex units. So disappointed in HomeAway, we will never believe ANY information for them (if we ever use them again)! The main HomeAway page sill calls this a single family!!!!!!!!!!! I am very sorry about your negative experience. Your vacation experience in our home came as a total surprise. During the course of your entire week stay, you have communicated having a wonderful time in our home so much so that a night before checking out, you have requested to extend your vacation and have promptly sent me the payment for the extended stay. I am very sorry that I mistook all your communication cues including the desire to extend your vacation in our home as a positive experience. Due to our location, we attract the family type of guest including my neighbor’s vacation home. The kind of guest that vacation in my home and our location are family types guest who relishes for a quiet, relaxing uncrowded beach experience. I am sorry that you are one very rare guest that have such negative experience in the past 15 years. Being a duplex did not mar my guest experience and in fact, many of my guests chose to come back year after year and have the same enjoyment as vacationing in a single family home. This is evident in all many previous reviews. I do not know what transpired between you and Homeaway Advisors. In all your pre-reservation inquiries and communication during your stay, this has totally been a non-issue. Unfortunately, I have not control over Homeaway option filters but on the section where I have control, I did describe our home as a duplex and there was no intention and no need to deceive as all my guest through the years have enjoyed their vacation in our home just as much. Our guest love our well furnished spacious home and our location where the beach just literally steps away! They love that they can relax, unwind and spend quality bonding time with their families. Our guest loves watching their kids enjoying their play on the quiet uncrowded beach and watch dolphins frolick on the blue ocean while sipping their favorite drink or meals on over covered deck in a quiet family friendly environment. Thank you once again for choosing to vacation in our home. Wonderful trip with our family! Loved the property. Will return again! A Family Vaction to Remember! The home is very nice making it warm and welcoming. Everything you would need for a nice family vaction. Make sure to bring extra toailt paper the hpuse had none, but other then this We found nothing wrong. The beach is beautiful, early morning coffee watching dolphins out on the porch off the master room or the family room was the best. We will be going back to Big Blue. We had alot of fun enjoyed alot of laughter and made some good memories. Thanks for sharing your home. The Woodards. Thank you so much for staying gin our home and for being such gracious guest. We do provide a initial start up supply of toilet rolls. Our guest are encourage to bring extra toilet rolls. I am glad that your family had a wonderful vacation. I look forward to hosting your vacation something in the near future. Thank you! Golf: value for value, this home offers luxurious value for the discriminating. Check out our guest book to see why this awesome Gulf Shores Beachfront vacation home is the choice vacation home! Strictly No smoking and No Pets allowed. Big Blue is furnished with 1 King, 1 Queen, 2 twins, bunk (with full-over queen and a twin trundle) and queen sleeper sofa. Amenities: phone, air conditioning, cable tv, 5 TVs ( in every room), 2 VCR, stereo, multiple covered deck, CD player, DVD, in-laid ceiling speakers, Playstation, beach chairs, beach umbrellas, full kitchen, microwave, dishwasher, refrigerator, ice maker, cooking utensils provided, linens provided, full washer and dryer, garden tub in master bath, his-and-her vanities in two bathrooms, walk-in shower in one bath, covered parking, charcoal grill (BBQ), beach umbrellas, beach chairs, private hot-and-cold shower outside, no smoking, no pets. Ski: Activities: Deep sea fishing, charter fishing, snorkeling, sailing, skiing, diving, multiple golf courses, aquarium via ferry ride, marina, outlet mall shopping, amusement centers, Bob Secour Wildlife refuge, bird watching, restaurants. Area: Fort Morgan is truly a nature lover's delight. Explore the trails of the Bon Secour protected wildlife refuge whose 6000 acres of varied ecosystems are home to 373 species of birds. Walk on the migratory path of the monarch butterfly. Fish in the surf or nearby in the bay. Build sandcastles in the sugar-white beach. Explore the Civil War fort made famous by Admiral Farragut's command 'Damn the torpedoes. Note: Until confirmed, rates are subject to change without notice. Weekly rates are for Saturday to Saturday rentals. Linens is provided. Free High Speed Wireless Internet Please add Cleaning Fee is $230& Tax 6.5% to all rates. Refundable $600 damage deposit Strictly No Smoking or Pets allowed..